The blank face of what will become “Z”. Constance and most of her sisters went to Oregon last week to attend a carving retreat taught by Janet Cordell and hosted by TC Vollum. From the point of view of the Hittys, it was very alarming to see the large number of sharp implements wielded by somewhat inexperienced woodcarvers. However, no Hittys were harmed, and because of Janet’s amazing talent and teaching skills (and with much help and encouragement) each class participant was able to add to the small wooden doll population of the world. “P” partly done (end of the first day!). Fortunately at this stage, the dolls are oblivious to carving, slicing, gouging, and all other methods of wood-chip generation. 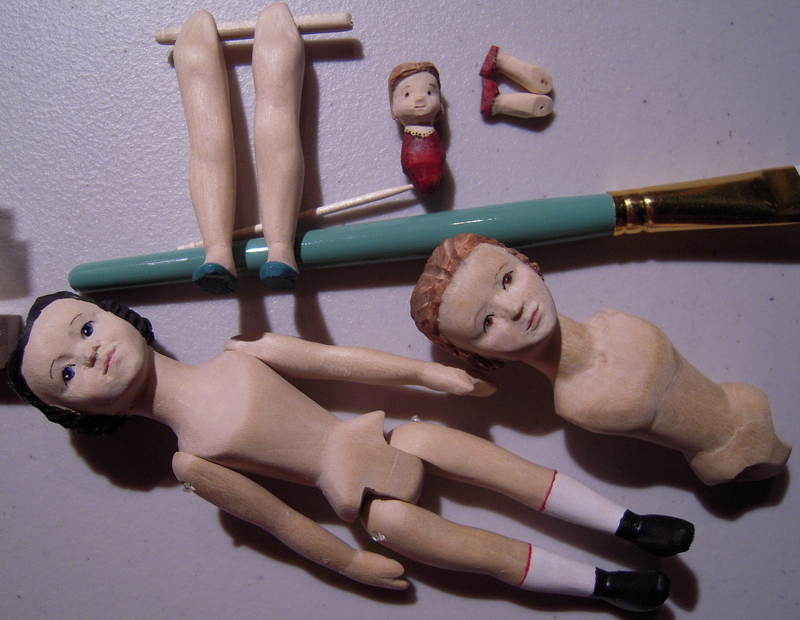 Various doll parts, drying out after a first coat of spray. The Hittys-to-be contemplate the collection of limbs. This is the point where modesty kicks in. 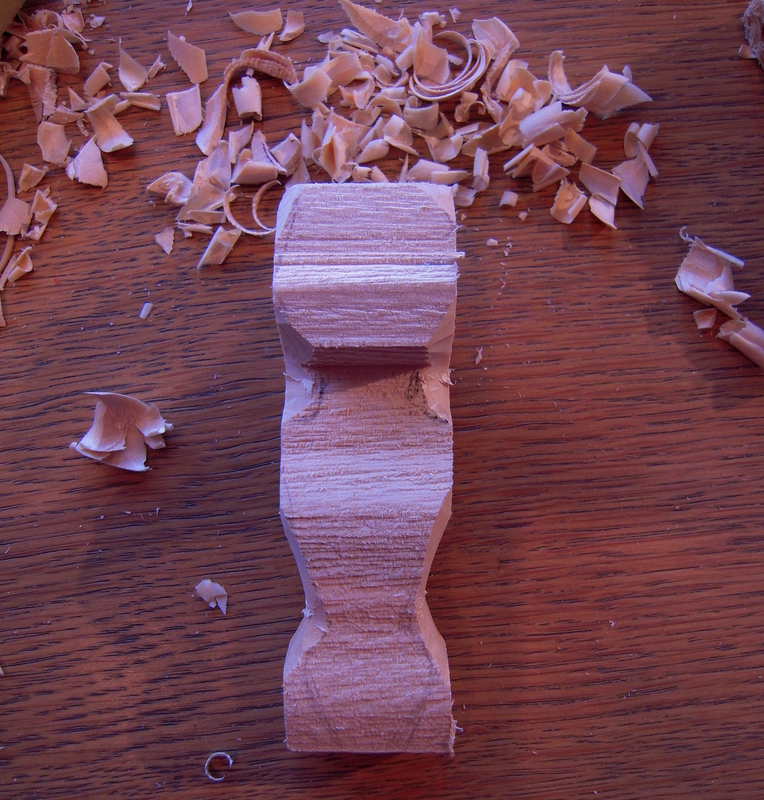 “See, now the doll has a face”…just like Phoebe’s mother in the book, I am amazed that such a small bit of wood can have a real nose and even a pleasant expression. The wooden doll-carving was inspired by the book Hitty, Her First Hundred Years by Rachel Field with Illustrations by Dorothy Lathrop. It was first published in 1929, and won the Newberry Medal, a US American award for excellence in Children’s Literature, in 1930. Read the book if you want to get a fictional sense of the world through the eyes of a doll through the 1800’s, though beware of the green paperback, which contains a number of unfortunate errors. Zipporah and Patience, in borrowed dresses. It will be fun to sew for the newest members of the Quimper Hitty household, but new patterns will have to be generated as they have more delicately proportioned figures. 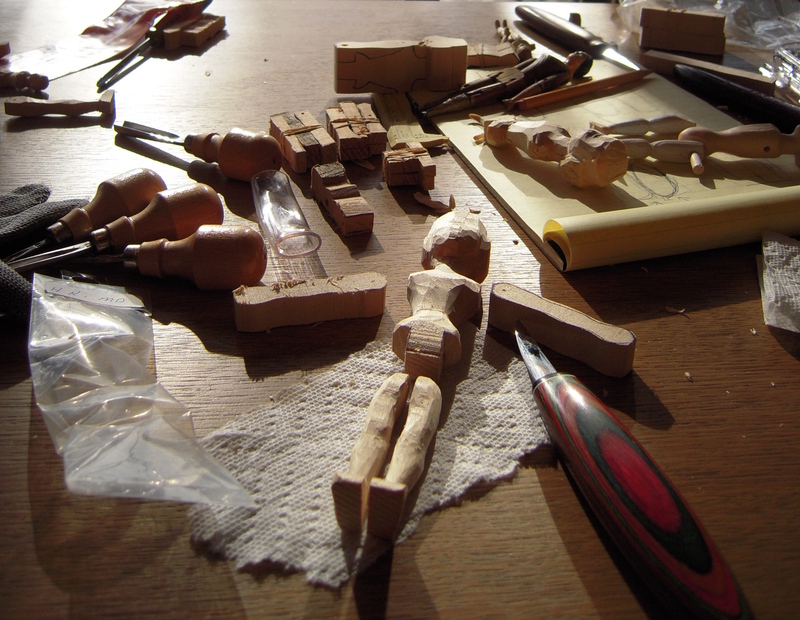 If anyone out there would like to learn how to or perfect their carving of a little wooden doll, I can’t recommend Janet Cordell’s carving workshops highly enough. Encouraging and talented, she also has an uncanny ability to take a half-carved monstrosity, and with a few flicks of her knife, repair something that seemed only good for kindling. I am very happy with the results, and can only hope that I can do half as well without Janet’s shoulder to look over, and her encouraging comments. Thanks Kimberly, the experience was unforgettable. I have to refrain from pinching the dolls to see if they’re real! 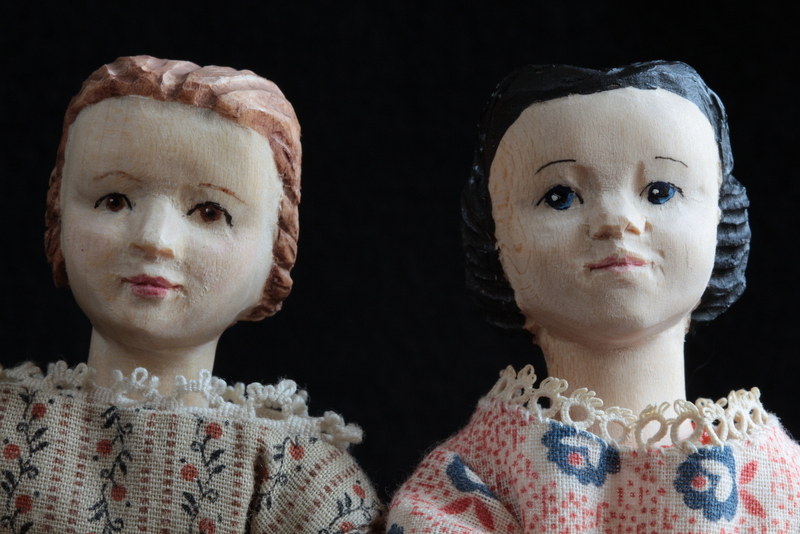 A doll has to speak to you – I think both the dolls I see here seem ‘alive’. I know Janet Cordell is very talented. What fun to be in one of her classes. Zipporah and Patience thank you, and look forward to playing with the rest of the Quimper Hittys – my dolls are all alive to me! You always have such nice names for your hittys and yes, they are all ‘alive’ and talk to you. My favorites are still Constance and Min, but they must be thrilled with their new sisters. Congratulations to all !! What wonderful new family members! Zipporah and Patience are beautiful. I cant wait to see their personalities shine. Thanks, Ryan. They both seem a bit shy but I am pretty sure the other Quimper Hittys have plans for them…I will just have to get some clothes made for them. Which will be exciting in itself! I was just talking you up at a small party this weekend. Beautifully done! Thank you for sharing a bit of your adventures with us as well as the results. Thanks Becky and you are welcome! We love adventures, but we don’t always come home with a new Hitty. What a wonderful post, I really enjoyed watching these incredible pieces come to life like this! I am glad you enjoyed it, and Zipporah and Patience are happy to have come to live with the Quimper Hittys!